Even though I tried to be good about not eating out while in Palm Springs, I had to succumb to my craving for some barbecue. Hence my visit to The Cowboy Way. I had driven by a couple of barbecue places and a friend’s words rang in my head - “Check Yelp before you decide.” Probably wise words. The closest place to where I was staying had a pretty bad write-up. Then a soul food place I had noticed had mixed reviews and was in the next town. There’s a lot of distance to places in PS and so I chose The Cowboy Way based on proximity and some good reviews. If you’ve never been to PS you should know that it has a one-way loop through the downtown district. Back in the 80’s this was the ‘cruise’ for us during college spring break. Basically my years shut down PS to spring breakers after all our partying made us unwelcome. I have the newspaper stories in my scrapbook to prove it. Ah, those were the days. Cowboy Way is located on the secondary road, coming back the other way. Less traffic and less businesses. It qualifies as a hole-in-the-wall type of joint. There’s a counter with about 15 stools and it’s a bare bones operation. On the wall there are framed awards and reviews saying how good they are. This, coupled with the reviews on Urbanspoon, led me here. I managed to snag a stool in an empty place right before the rush hit. I noticed many people came to pick up take-out orders. 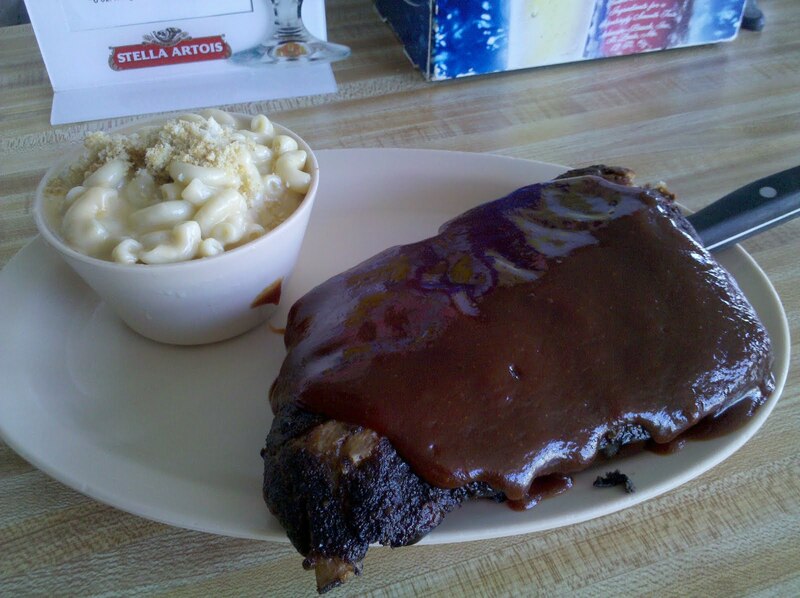 I ordered a half rack of babyback ribs with a side of mac n cheese. Let’s just categorize it all as - mediocre. The ribs were fine, but nothing special. Tender enough and covered in a sauce. But it wasn’t anything that stood out as unique, original, or noteworthy. Especially bad, the mac n cheese which tasted like it was made from the powdered cheesey stuff like you get in the famous blue box. How was this all award-winning when it seemed it came from a jar/box? 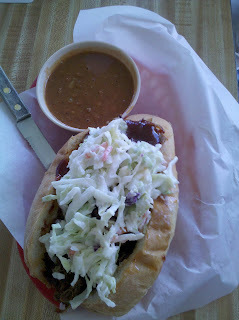 Perhaps I’m spoiled by our fine BBQ establishments in Sac, like Sandra Dee’s. I was more impressed by the pulled pork sandwiches which my dining neighbors received. These things were huge! It looked like perhaps I had made the wrong menu choice. Interestingly, as well, was that I witnessed the waitress several times get packages of pre-cooked ribs out of a frig to give the kitchen. They weren’t store packages, but ribs that had obviously been prior cooked and then wrapped in saran wrap until they would be needed. I think I’d prefer to have freshly cooked and had I seen this before I had ordered I probably would have walked out. So, in summary, if this is the best that the area has to offer for barbecue, I’d say try some other cuisines and save barbecue for your return home.